Working out at a gym or fitness center can help you take your fitness program to the next level. Fitness centers give you access to instructors and trainers, a wide variety of equipment and, often, group exercise classes, a sauna, a pool, and other amenities. Also, making a financial commitment can help to motivate you to exercise more regularly. So, how do you choose a facility that is right for you? Before joining a gym, ask yourself what it is you are looking for and define some fitness goals. For example, are you more interested in aerobic fitness or weight training? If you want to improve your aerobic fitness, look for exercise bikes, treadmills, stair-climbing machines, and elliptical trainers. If you want to do mostly weight-training, look for a wide variety of weight-stack machines, barbells, and dumbbells. According to marketing data from The Active Network, Inc., there were 29,069 health clubs in the US in 2006. So, you should be able to find one in your area. • Location: Is the facility convenient? If you have to drive more than 5-6 miles, chances are, you may not use it regularly. • Hours: How busy is the facility during the time(s) when you can workout? Many gyms are busiest on Mondays, Wednesdays, and Fridays, between 6-8AM and between 4-6PM, ie., many people like to exercise just before or just after work. • Environment: Is the environment too intimidating or competitive for you? Do you prefer a facility that feels more like a spa? Is the facility clean? If the facility has showers, inspect them. These "wet areas" are the most challenging for fitness centers to keep presentable. If they do a good job here, chances are, they will be doing a good job in other areas. • Equipment: What does the equipment look like? Are the weight-stack machines in good working order, or are some of them broken? Ask if you can try them out. They should have a silky-smooth movement throughout the entire range of motion. With regards to aerobic equipment like treadmills, stationary bikes, and elliptical trainers, how many does the facility have? Because people stay on these machines for 30 minutes (or more!) at a time, make sure there are plenty of them so you don't have to wait in line. Also, if you want to swim, and the pool is only a 6-lane lap pool, then it will only take 6 people to create a waiting line for that. • Staff: Is the staff friendly and helpful? Do they make a good presentation the first time you visit? If you join, will the trainers help you get started on a fitness routine? Do the trainers have degrees in exercise physiology, or, are they certified by an organization such as: American College of Sports Medicine (ACSM), American Council on Exercise (ACE), National Academy of Sports Medicine (NASM), or the National Strength and Conditioning Association (NSCA). See the related story "How to Choose A Personal Trainer" . • Programs and classes: Are you interested in group exercise? If so, check the weekly schedule of classes. If you are looking for specific classes, such as spinning, kick-boxing, or Tai-Chi, make sure to ask about those. If you want to do any of these group exercise classes, find out when they are offered. It's possible that the class you want is only offered once per week. Not only may that time not be ideal for you, the class might be very crowded. • Other features: Does the center offer showers, a sauna, massage, on-site child care or other services that you would use? Does it provide entertainment while working out such as TVs or music? If you have special needs, can the fitness staff accommodate you? • Contract terms: Some gyms allow you to pay on a month-to-month basis, while others may ask you to sign a multiple-year contract. In the state of Florida, "health studios" are prohibited from creating contracts that obligate the consumer for longer than 36 months. Ask about a trial membership. Many centers offer a temporary pass that permits you to check out the staff, classes and equipment. • Price: Ask yourself if the price is within your budget. Check the prices on other facilities, even if they are not in your neighborhood to get a feel for comparative pricing. • Right to receive a refund: In some states, you may be entitled to a refund if you become physically disabled, or move more than 25 miles away. • Right to cancel: In Florida, a "3-business day" clause exists. If you sign a contract, you have 3 business days to change your mind and cancel it. Check with your state consumer protection division regarding rules and regulations governing fitness club contracts. • Bike parking: Doesn't it seem silly to drive to a facility where you are going to ride a stationary bike for 30-40 minutes? Why not ride your bike there, do your work-out, and then ride home? You'll save gas, reduce congestion at the facility's parking lot, and add a stimulating element to your exercise routine. But, you'll need some place to lock-up your bike when you get there. • Lockers: If the gym has showers, then chances are it also has lockers. But are there enough during peak hours? Check them out, too. Do any look like they have been broken into? • Financial status: Find out if the facility you want to join has posted a bond. This would indicate that the organization is fiscally responsible. In Florida, this is a requirement for some health clubs. And, if they haven't posted such a bond, they are required to tell you that. If a health club goes out of business, there is a greater chance you could recover some of your funds if they have posted a bond with the state in which they do business. • Create a weekly workout schedule. Then, stick to it. Human psychology shows that it takes 3-6 months for a new routine to become a habit. Consider working out with a friend to help keep you motivated to go to the gym. • Add variety to your routine to keep it from becoming stale. Try a new machine or a new class from time to time. • Keep track of your progress by measuring your health and fitness targets on a regular basis. Note, this does not mean "become obsessive at watching your weight". Fitness targets such as resting heart rate, oxygen uptake, and assessments of strength and flexibility, and, health targets such as blood pressure, cholesterol levels, body-mass index and waist-to-hip ratios are more important health and fitness parameters than body weight. Several web sites have search tools that help you find a health club. The best one I have found is GymTicket.com. By entering a zip code, you can obtain a list of facilities within 30 miles of the center point for that zip code. Their database contains over 15,000 facilities, the largest and most accurate database of fitness centers in the US. 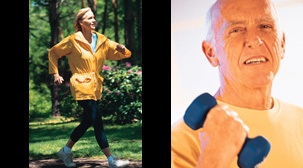 American Council on Exercise (ACE): www.ACEFitness.org. 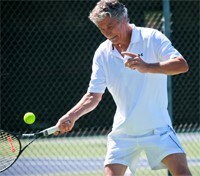 Get Active America (supported by IHRSA): www.GetActiveAmerica.net. • www.24HourFitness.com has a nifty map of the US showing the locations of their clubs in 16 states, most of which are west of the Mississippi. • www.HealthClubs.com is a web site maintained by IHRSA. This web site has a club-finder feature, though it only lists clubs that participate in the IHRSA Passport Program.